It’s a high school. It’s a college. It’s an adult learning center. No, wait, it’s all three. Since its start in Jan. 2017, Pierce College at Graham, located at Graham-Kapowsin High School, has really taken off, filling a need for access to higher education in the fast-growing communities of southeast Pierce County. About 80-90 students currently attend each quarter, ranging from Running Start students to older returning students who want to begin or finish their associate’s degree. “Students often share that it’s the convenience factor that appeals to them,” says Deborah Davolio, Graham Pathways Project Manager. “They like taking classes closer to where they live or work.” She also points to the evening class-only format as a key draw for students. “Many students take morning classes on the main campuses or online. Then they take an evening class here to save on driving time,” she says. Nathan Navarrette-Smith, a 20-year-old Graham resident and volunteer firefighter with South Pierce Fire and Rescue, agrees. “When I saw classes were offered in Graham, so close to my home, I was excited,” he says. A graduate of Graham Kapowsin High School, Navarrette-Smith took classes at Pierce College’s Fort Steilacoom and Puyallup campuses where he earned his Emergency Management Certificate. He now takes classes in Graham, where he will complete his associate’s degree this winter. The Graham location makes it easier for him to juggle school with his 12-hour shifts at the fire station. “They accommodate working people,” he says. With the goal of becoming a paramedic, Navarrette-Smith will transfer to Central Washington University to earn a bachelor’s degree and then return to Graham to work. “I love to give back and help our community,” he says. The convenience of the Graham campus also appeals to Brandi Eddo, 36-year-old wife and mother of three. Originally Eddo’s goal was to get into a field like medical billing. She has since discovered a passion for English, writing and public speaking that shifted her career focus to teaching. After completing her associate’s degree, Eddo plans to earn a bachelor’s degree in teaching from Western Governors University (WGU), an online university. Eddo, like many students, also appreciates the smaller class sizes at Graham. 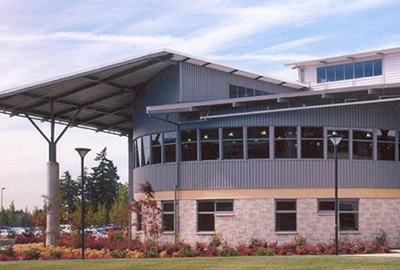 For more information on Pierce College at Graham, contact Deb Davolio at 253-912-2399, ext. 8788, or visit www.pierce.ctc.edu/graham. Students interested in starting in fall quarter can also follow the Get Started steps on our main page and contact Teri Kendall at the Puyallup Student Success Center at 253-840-8431.